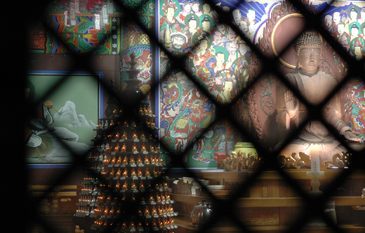 Hundreds of years ago, as a result of continued persecution under the Joseon Dynasty thousands of Buddhist temples in Seoul and other Korean cities were either destroyed or shut down. Seeking a place to live and practice their faith in peace many monks packed up and relocated to remote mountain areas in the countryside, which to this day are peppered with Buddhist temples constructed as a result. 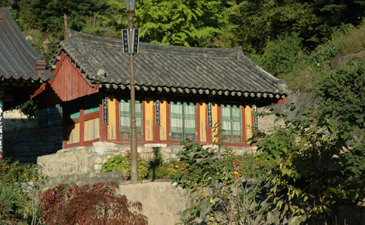 Modern times and it has become increasingly popular for Koreans and Foreigners alike to flee the city environs and head for the hills to participate in one of the many temple stay programs currently on offer. The program was first introduced during the 2002 FIFA World Cup and was such a success that it has been further expanded and more temples are joining all the time. 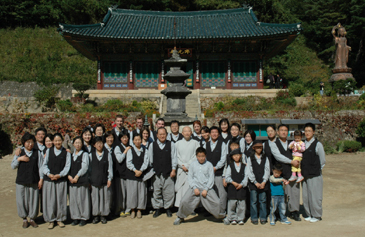 Wondering what all the fuss was about I accompanied some 30 journalists on a trip to Samhwa-sa in Gangwon-do on Oct. 15, 2005. 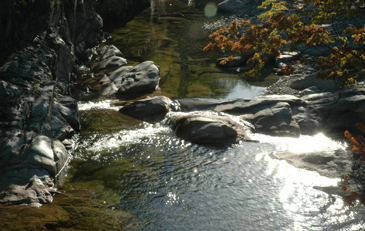 Samhwa-sa is located at the entrance of the Mureung Valley and, as has been the case many times in the mountains of Korea, the idyllic beauty of it's location took my breath away. 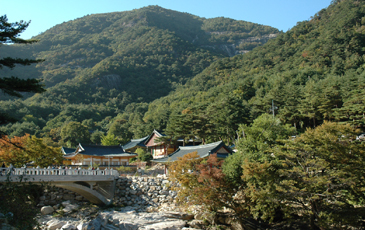 The main temple compound nestles in a mountain bowl surrounded on three sides by densely forested granite faces. Reddening timidly the maple trees had not quite yet sacrificed their summer green for the colorful hues of autumn. Arriving around three in the afternoon our guide and translator first showed us to our living quarters where we dropped off our luggage and changed into monks apparel. Comfortable and loose, the uniforms alone made me feel more calm and relaxed, although the pants did bear a striking resemblance to those worn by the artist MC Hammer! A brief tour of the temple grounds followed, during which we received a basic education on the history and significance of the different buildings and monuments. 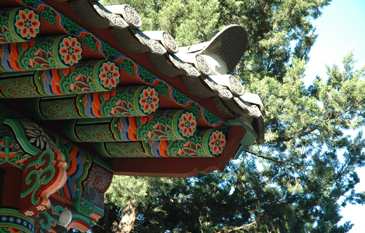 Although smaller than other Korean temples I have visited, this lent to the creation of a more participatory and personal atmosphere. A three storied pagoda or stupa is centered in the main temple square. Found at most Buddhist temples, these monuments contain either relics of Sakyamuni Buddha himself or artifacts associated with him. Buddhism conveys certain lessons through colorful murals which adorn both the main temple buildings and both of the entrance gates. Striking for their simplicity the messages make sense even for someone such as myself, pretty unfamiliar with Buddhism. On the main temple hall the attempts of a boy trying to gain control of his ox are illustrated. The ox represents the mind and the central premise is that although it may be stubborn, with training we can make it pure and that even in seemingly the worst person lies a good heart. Despite a large meal at a restaurant en route to the temple earlier that day, by late afternoon I was ready for the so called "baru gongyang" or four-bowl meal. A traditional Buddhist way of eating, it seeks to combine philosophy with the consumption of food. Sitting cross legged for the duration the meal proved the most difficult aspect for me as I'm still not any measure more flexible than when I first arrived in Korea. Although unusual, the steps involved in the meal simply involved following the leading monks' instructions. The four bowls contain rice, soup, side dish and water respectively. Eaten in silence the experience is supposed to endow a person with a greater appreciation for the food and where it came from. After finishing everything, which is compulsory, the water in the fourth bowl is used to clean each of the other bowls with the aid of your chopsticks and a single kimchi leaf you are asked to keep for this purpose. All the bowls fit into each other for compactness and after drying they are wrapped along with the chopsticks back into their wrapping cloth. 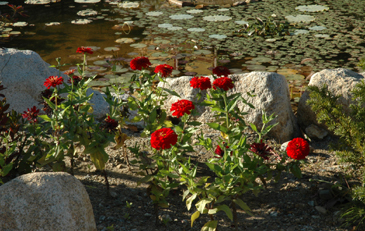 The process does capture the sense it is attempting to convey- unity, equality, purity and economy. 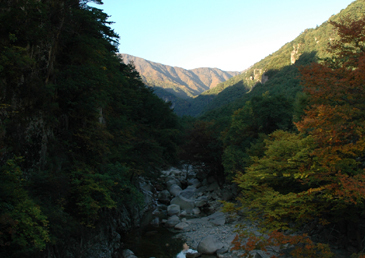 Upon finishing the meal the ringing of the evening bell began to echo around the mountainside. Located in the temple square the bell is struck 33 times in the morning and 28 times in the evening. Each of us had a chance to send it's calming sound out into the darkness. Feeling suitably spiritual the evening chanting or yebool was next A formal bow before the Buddha consists of a standing bow with both hands together (hap jang) followed by three prostrations ( oh-che-tu-ji) and then another standing bow. 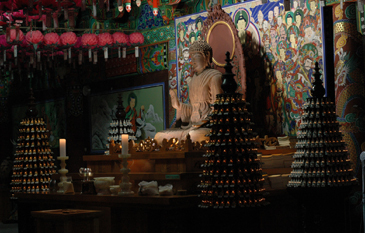 During prayer sessions monks typically repeat this procedure 108, 3000, or 10000 times, or more. It is considered a supreme form of both physical and mental exercise. We completed significantly less repetitions than mentioned above. Perhaps they were taking it a little bit easy on us so as not to scare us off! Another ritual of Buddhist life, the tea ceremony of Da-do was next on the agenda. After instruction on how to prepare the green tea, we sat in groups of three and four and relaxed while discussing our thoughts of the experience so far. The preparation and consumption of the tea is organized so as to evoke all five senses: Listening to the sound of the water boiling, smelling the fragrance, seeing the beautiful color of the tea in the teacup, tasting the tea and feeling and enjoying the warmth of the teacup itself. 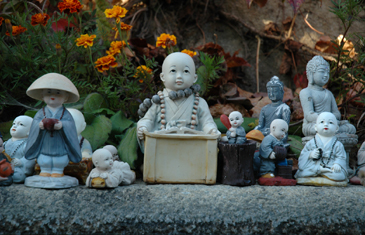 Every waking moment in a Buddhist temple seems to be guided by some set or behavioral pattern or underlying philosophy. Monks are constantly seeking to enhance mindfulness while engaging in mundane daily activities. 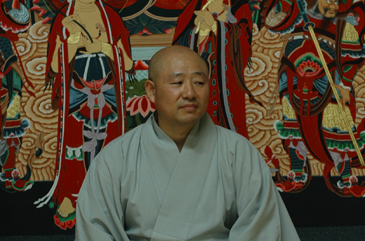 Before bed we had a question and answer session with Won-Myeung,the "seunim" or head monk who has been stationed at Samhwa-sa for the past five years. He explained that the ultimate goal of the temple stay program is to give people an introduction, albeit a brief one, to the Buddhist faith and the daily life of the monks . His hope is also simply to provide people with a memory or experience that they might look back on later in life. 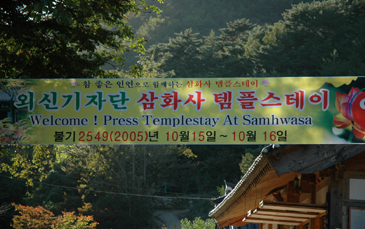 "The theme of every temple stay is different" he stated, "the theme at Samhwa-sa is that of slow living." Bedtime came at ten o'clock in preparation for waking long before dawn the following morning. I had been a little worried I'd find it hard to sleep but after the day of self reflection and meditation I probably could have dozed off in the temple square never mind the cosy, comfortable room we had been assigned. 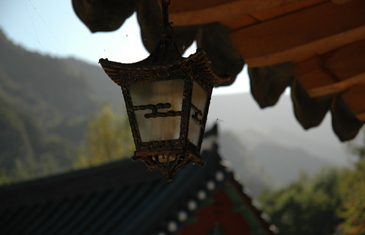 Having an uncanny knack of waking at home a moment before my alarm goes off, possibly a subconscious reaction to save myself from the shock, I was already getting up when the bell being rung by one of the monks circling the temple grounds echoed into the dormitory at around 4 a.m. Gathered in the main hall the morning chanting began. Personally I got more out of it than the evening chanting, undoubtedly due to the crisp morning air and the fact that I was just out of bed with a clear mind. After a session of prayer bead bracelet making we traveled by bus to Chuam beach to catch the sunrise. Candlestick rock (Chotdaebawi) , famous for it's appearance with the national anthem at the end of transmission each night on KBS, lies just off the coast. Taking position at a vantage point located inside a coastal military area, we waited in anticipation. Around 6:30 a.m. the sun shyly rose above the horizon. Of the few sunrises I've witnessed it will probably go down as one of the most memorable and the handful of onlookers also seemed to be suitably impressed. Back at the temple itself we enjoyed a breakfast of rice and what appeared to be the remainder of the side dishes we had partaken of the previous evening. 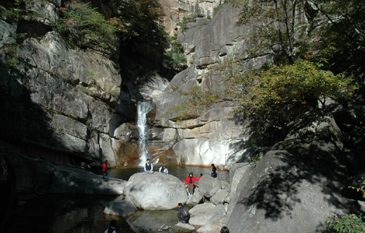 A hike up the valley to view two impressive waterfalls rounded off the program. The visit was interesting and informative but for me a little incomplete; I learned a lot but only intermittently had a glimpse of what a monk's life entailed. It felt more like an intense guided tour than an immersion into the life of a monk. I fully understand that 24 hours in a temple is not enough to see the inner workings of a lifetime of devotion, but I was thirsting for more and think I'll definitely have to return for either the week or month long temple stay program sometime in the near future. Starting young at Samhwasa Temple! The above photos were taken by Adam Dean, photo journalist.